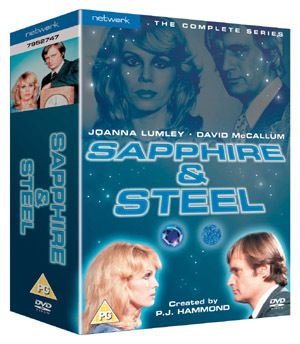 Set in a world in which the future and past collide and time overturns reality, SAPPHIRE AND STEEL will capture your consciousness and transport you to altered states. Eerie, frightening forces are at work and Sapphire and Steel have been assigned...Only Sapphire and Steel (Joanna Lumley and David McCallum) can stop the strange events and restore natural order to the universe. These two superhuman agents have been assigned to safeguard the structure of Time. With their uncanny powers they protect the present from malign forces from the past and future. This set is elemental to any DVD collection and available to buy on 5th November 2007, RRP £59.99. 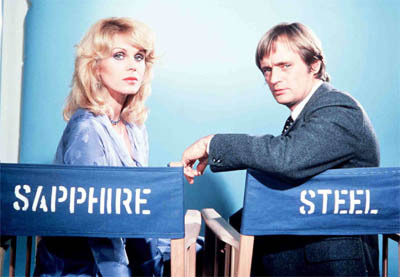 Though-provoking, unsettling and powerful drama with a supernatural twist, SAPPHIRE AND STEEL was created by acclaimed TV writer PJ Hammond (Torchwood, Ace of Wands). The show built up a massive cult following when it was originally broadcast on ITV nearly thirty years ago and remains a much talked about show to this day. Dangers from the mysteries echoing along the corridors of time face two children in a lonely house when their parents suddenly disappear. They have not walked out - they have ceased to exist in the time we know as the present. Equally mysteriously, two strangers arrive on the scene. 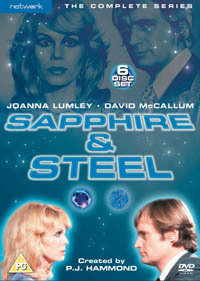 Their names are Sapphire and Steel, but who are they? Can they bring back the parents who have been trapped by unknown powers? Silver joins Sapphire and Steel into their latest investigation of a present-day time break which points to 1948. Who are the young couple they find at the cafe and how are they involved with the bewildering shift in time.